Caterpie in game: 2,711 Who? Important notice! Pokemon Caterpie is a fictional character of humans. Caterpie (Japanese: ??? ?— Caterpie) is a Bug-type Pokémon. It evolves into Metapod starting at level 7, which evolves into Butterfree starting at level 10. Caterpie is a Pokémon that resembles a green caterpillar. There are yellow ring-shaped markings down the sides of its body, which resemble its large yellow eyes. Its most notable characteristic is the bright red antenna (osmeterium) on its head, which releases a stench to repel predators. This structure and the large eye-shaped markings help to startle predators. Its feet are tipped with suction cups, permitting this Pokémon to scale most surfaces with minimal effort. Caterpie will shed its skin many times before finally cocooning itself in thick silk. It can also spit this silk in order to entangle foes as seen in the anime. Its primary diet is vegetation, and its voracious appetite causes it to eat leaves larger than itself. According to Pokémon Adventures, its favorite food is the Vermilion flower. Caterpie lives in forests. A Caterpie was the first Pokémon that Ash Ketchum caught from the wild, in Ash Catches a Pokémon. It evolved into Metapod in the same episode, and then into Butterfree the following episode. Bucky owns a Caterpie as seen in The Dunsparce Deception where he used it to compete in a race with Dunsparce but lost due to its slow speed. A Caterpie that appeared in Caterpie's Big Dilemma belonging to a young Trainer named Xander ate some of Dr. Gordon's enhanced Rare Candies and turned giant. Xander's Caterpie eventually evolved into a Mothra-sized Butterfree. A Caterpie appeared in Butterfree and Me!. A Caterpie appeared in Bulbasaur and the Hidden Village. It was one of the Pokémon in Melanie's care. It reappeared in a flashback in Bulbasaur... the Ambassador!. A Caterpie appeared in Electric Shock Showdown under the ownership of an unnamed Trainer. A Caterpie also appeared in Battle Aboard the St. Anne, Pokémon Fashion Flash, The Breeding Center Secret, Clefairy Tales, Mewtwo Strikes Back, Camp Pikachu, Pokémon Heroes: Latios & Latias, Destiny Deoxys, and One Team, Two Team, Red Team, Blue Team! A Pink Caterpie appeared in In the Pink, residing on the Pinkan Island. Multiple Caterpie appeared in Tracey Gets Bugged, Celebi: Voice of the Forest and Coming Full-Festival Circle!. Ralph and Emily were both shown in a flashback to have once owned a Caterpie each in Wherefore Art Thou, Pokémon?. A Caterpie appeared in Illusion Confusion! as an illusion created by Haunter and Gengar. Multiple Caterpie appeared in For Crying Out Loud where they were accidentally wet by Wilhomena's Marill. Multiple Caterpie were in Azalea Gym in Gettin' The Bugs Out. A Caterpie appeared in The Bug Stops Here. Misty chases it away when it is talking with Togepi. A Caterpie was one of the sick Pokémon in a Pokémon Center in Carrying On!. A Caterpie appeared in Jessie's fantasy in Wings 'N' Things. A Caterpie was one of the inhabitants of an oasis just for Pokémon in Got Miltank?. Multiple Caterpie appeared in For Ho-Oh the Bells Toll! where they protected the Tin Tower after Team Rocket stole the crystal bells on the top floor. In Talkin' 'Bout an Evolution, Team Rocket's experiments made Pokémon feel sick, one being a Caterpie. A Caterpie was used by one of the students of the Pokémon Trainer's School in Gonna Rule The School!. A Caterpie appeared under the ownership of a Coordinator in Hi Ho Silver Wind! A Caterpie also appeared in One Big Happiny Family! in Jessie's fantasy. A Caterpie also appeared in Genesect and the Legend Awakened at Pokémon Hills. A Caterpie appeared in Alexa's magazine in The Journalist from Another Region!. A Caterpie appeared in Kalos, Where Dreams and Adventures Begin!. A Caterpie appeared in Lumiose City Pursuit!, Mega-Mega Meowth Madness!, Day Three Blockbusters!, and Battling With a Clean Slate! at Professor Sycamore's lab. A Caterpie appeared in a flashback in Seeing the Forest for the Trees!. A Caterpie appeared in SM003, as a silhouette. Two Caterpie appeared in SM008. AG142 Caterpie May's Pokédex Caterpie, the Worm Pokémon. Caterpie uses the suction cups on its feet to climb trees and feed on its favorite leaves. BW130 Caterpie Ash's Pokédex Caterpie, the Worm Pokémon. To repel enemies, Caterpie releases an unpleasant odor from its red antenna. It molts several times while growing. Red caught a Caterpie which was registered in his Pokédex. It evolved into Metapod before his Gym battle with Brock. Two Caterpie appeared in File 3: Giovanni caged in the Rocket Hideout and Silph Co.while Team Rocket was around. A wild Caterpie appeared in Viridian Forest in The Adventure. Ash's Caterpie appears in the manga series The Electric Tale of Pikachu. Caterpie is the second wild Pokémon that Ash captures in the manga. It was caught in Pikachu, I See You!. It evolves twice in Play Misty For Me—first into Metapod while Ash is showing off his Pokémon to Misty, and then into Butterfree during his Gym battle against Misty. Ash is not shown releasing his Butterfree in the manga, although it is not seen after Haunting My Dreams. Caterpie's first appearance is a cameo in Bulbasaur, Come Home! as one of the Pokémon that escapes from Professor Oak's Laboratory. It also makes a cameo in The Secret of Kangaskhan. Another Caterpie appeared as a silhouette when Green explains about Mew in The Jynx Jinx. Caterpie made its main appearance in the Yellow chapter in As Gastly as Before. With the help of her fishing rod and Red's Pika, Yellow saved a Caterpie from its tree, which was targeted by a fire attack. Caterpie then followed Yellow to where she and Blue were training, next to the Rock Tunnel. It took Yellow a whole day to properly catch this Caterpie with a Poké Ball, but once she prevailed, Yellow welcomed Caterpie to her team and called it "Kitty". It then became one of Yellow's most useful Pokémon, whose string was commonly used to make floaters. However, in the battle against Lance, Yellow did not have a Pokédex, which she needed to stop her Pokémon from evolving, and so Kitty evolved into Metapod and then into Butterfree right afterwards. A Caterpie was mentioned as one of the Pokémon Crys had captured for Professor Oak in Three Cheers for Chikorita. A Caterpie was one of the Pokémon Crystal fails to catch in Absolutely Azumarill. A Caterpie appeared in The Last Battle XIII as one of the Pokémon sent to help the fight in Ilex Forest. Shu has a Caterpie that he uses in various creative ways, mostly involving strange uses of its String Shot. In Pokémon Mystery Dungeon: Ginji's Rescue Team, Ginji saved a Caterpie from an attacking Ariados. A Caterpie is seen with Green during the baseball match that took place in Fierce Competition at the Pokémon Baseball Tournament!. Pokémon Mystery Dungeon: Caterpie is rescued in the first mission of the game. It is too young to be of any help to the rescue team but remains a strong fan throughout the game, even in its darkest hour. It has large, eye-like patterns on its head as protection. They are used to frighten off enemies. For protection, it releases a horrible stench from the antennae on its head to drive away enemies. Its voracious appetite compels it to devour leaves bigger than itself without hesitation. It releases a terribly strong odor from its antennae. It's easy to catch, and it grows quickly, making it one of the top recommendations for novice Pokémon Trainers. Moves marked with a superscript game abbreviation can only be bred onto Caterpie in that game. 51%-100% HP I'll eat lots and grow big. 26%-50% HP This is so hard... My health is down to half. Level up I leveled up! Happy! Caterpie fell out of the White Tree on the other side of the bridge in the Meadow Zone! Her favorite Attraction is Bulbasaur's Daring Dash. Their steps are slow, but they are quite aggressive and hate to lose. They are second to none in spirit. 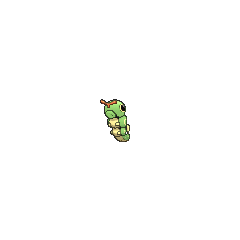 For other sprites and images, please see Caterpie images on the Bulbagarden Archives. Caterpie was both the first Pokémon to be captured and the first Pokémon to evolve in the anime. 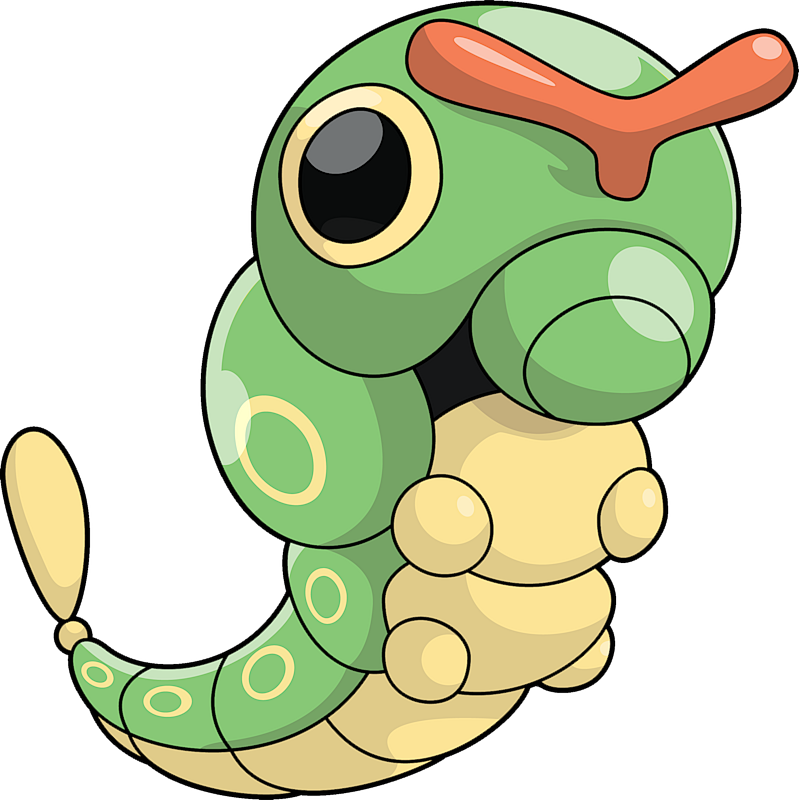 Caterpie shares its category name with Wurmple. They are both known as the Worm Pokémon. Until the release of Pokémon Platinum, when it became able to learn Bug Bite, Caterpie was unable to do anything to a Ghost type outside of struggling except lower its Speed. It shares this trait with its evolution, Metapod. This is also true for Weedle, and its evolution, Kakuna, against Steel types before Pokémon Platinum was released. Due to this, it was impossible to complete a Generation I game using only Caterpie or Metapod, since Struggle couldn't hit Ghost types at the time. 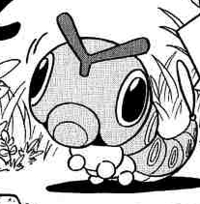 In the anime and in Pokémon Adventures, Caterpie holds the record as the Pokémon who takes the least time to evolve twice, taking only one episode in the anime and one chapter in Pokémon Adventures. Poliwag and Togepi also share this record, but in Pokémon Adventures only. Prior to Generation VI, Caterpie's body style was . In Ash Catches a Pokémon, when Caterpie evolves into Metapod, the process was similar to a real caterpillar going into pupation. Later episodes show Caterpie evolving like the rest of the Pokémon do. 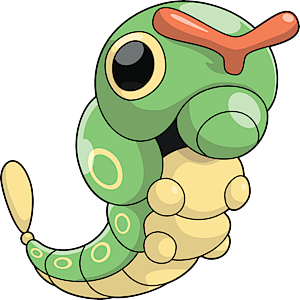 Caterpie is tied with Weedle for having the lowest Special Defense stat of all Bug-type Pokémon and is tied with five other Pokémon for having the lowest Special Defense stat of all Pokémon. 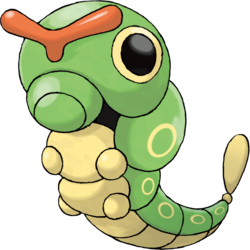 Caterpie is a stylized caterpillar, most resembling an Asian swallowtail. Its "antenna" is an osmeterium, an organ unique to swallowtail caterpillars which, like Caterpie, they use to emit a foul odor. The tip of Caterpie's tail resembles the horn at the rear end of most species of hawk moth larvae. Caterpie is a corruption of caterpillar. Cantonese Chinese ??? Luhkmòuhchùhng "Green caterpillar", or literally, "Green furry worm"
Mandarin Chinese ??? / ??? Lumáochóng "Green caterpillar", or literally, "Green furry worm"